TSPSC has notified that, on the basis of Main Examination and subsequent certificate verification for the posts of Junior College Lecturers in REIS vide Notification Nos. 27/2017 respectively; the candidates with the Hall Ticket Numbers are provisionally shortlisted for Interview at TSPSC Office from 10:00 AM onwards. TSPSC JL Junior Lecturers Results with provisionally shortlisted for Interview. TSPSC JL Junior Lecturers Results with List of Qualified Candidates for Interview. 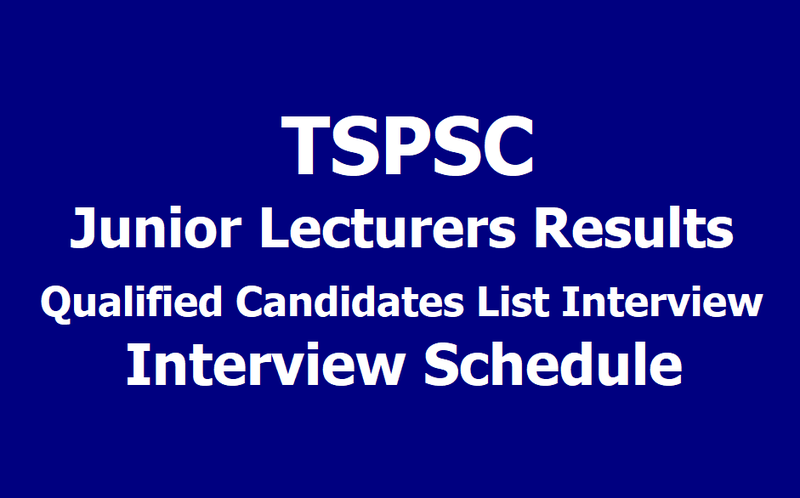 TSPSC JL Junior Lecturers Provisional Selection List Results, TSPSC JL Junior Lecturers Interview Dates, TSPSC JL Junior Lecturers Interview Schedule and more details are available at tspsc website. The candidates who are provisionally admitted for Interview are required to attend along with Hall-Ticket, (3) Pass port size photos and Verification Certificate which is issued by the Commission at the time of verification failing which, they will NOT be admitted in subsequent process of selection. . The Interviews will be scheduled from 16/04/2019 onwards at the Commission’s Office, Prathibha Bhavan, Opp. Gagan Vihar, M.J. Road, Nampally, Hyderabad. A copy of this result can also be seen on the Commission’s Notice Board. The candidates are hereby instructed to give their online zonal preferences i.e., Web options on 09/04/2019 Onwards failing which their candidature may not be considered for selection. Admission of the candidate is purely provisional and Commission reserves the right to cancel the candidature of a candidate at any stage, if filling of false information or suppression of facts or Conduct not in accordance with the terms and conditions of the Notification is noticed. Hence admission to Interview does not confer ipso facto right for Final selection.